The Sri Lanka Police Service is to be presented with a new face to serve the public in a more effective and efficient manner. All measures are in place to introduce a new plan for the next five year period for the Police Service, Inspector General of Police Pujith Jayasundara said.The IGP said this special plan will address all fields in the police service including recruitment, training, international relations, promotions, infrastructure development, scholarships, road safety, crimes investigations and human resource management. 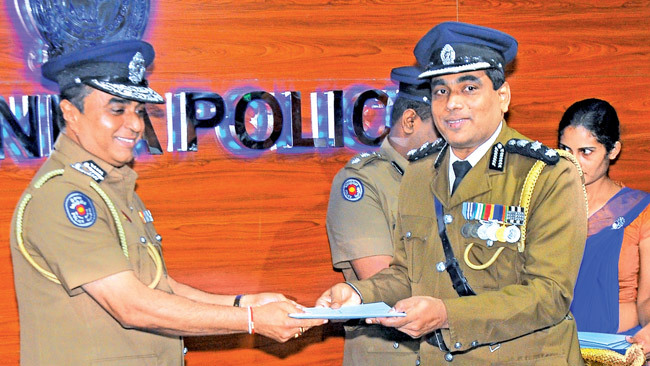 The IGP was addressing a ceremony at the Police Headquarters yesterday to present appointment letters to 14 new Deputy Inspector Generals (DIG) of Police. SSP Ajith Rohana, SSP Wasantha Wicremasinghe, SSP Padmalal Sandungahawaththa, SSP Champika Siriwardhena, SSP Priyantha Jayakody, SSP Nimal Perera, SSP Mervin Wickremasinghe, SSP Gregory Cooray, SSP R N Welikanna, SSP D R L Ranaweera, SSP K B Mahagedara, SSP M B Ellepola, SSP David Gajasinghe and SSP Palitha Fernando received promotions as DIGs. Addressing the ceremony, IGP Jayasundara said: “We hope to make Sri Lanka Police Service more effective and efficient with the aim of providing a better service to the nation. In that effort we hope to obtain the support of all fields including the media. In the attempt of making the police service more public friendly the media has to play a vital role, while reporting the deeds of the police. All vacancies of Senior DIGs and DIGs have already been filled and arrangements are in place to grant functions to them based on their knowledge, seniority and aptitude. Other vacancies in the police service are also to be filled within a short period. Promotions cannot be granted and it should be earned by persons, he said. Modern Community Policing is a only solution to broken country. Fox Guarding the Hen house The policy makers who have been toiling and burning their mid night oil to carve a new identity to the law enforcement agencies in our land should bare one thing in mind before kick-starting something new should be the humanitarian approach towards the common man in our land. As far as I am concern, there shouldn't be any political interference which dramatically ruin the entire good will of the law enforcement officers those who are born to serve our people irrespective of colour, cast and creed of any sort. Do not let the fox guard the hen house! Do not let the politicians poke their nose into the police department , which has already had tremendous sets backs in building a strong bridge between the peoples of this nation and the law enforcement agents. Never again become a mere puppet of any negative forces in our land. Aim high and be strong!